I can’t remember if I’ve mentioned this or not (and quite frankly, I’m too lazy at the moment to open a web browser and type in a couple of search terms to find out, which seems like I’ve leveled into a whole new echelon of slothfulness, if you ask me), but I’ve been doing an absolutely miserable job of curating my Netflix queue lately. I mean, I believe I have some of the most recent releases somewhere in the basic vicinity of the top of the list for the disc-by-mail service. Then again, I once believed I could run so fast no one would see me. So, my personal faiths might not be the best thing to hang your hat on. The worst thing is, I’m also not remembering to remove movies I don’t need to get anymore. Case in point, a few weeks ago, I watched The Hobbit via pay-per-view – because, I’m impatient like that sometimes – and then, just three short days later, received that very film by mail because I’d forgotten it was currently King of the Queue. And nobody’s got time to watch three hours of the same first third of a book twice, knowutImean? Anyway, at some point in the not too distant past, the Kevin James, school-teacher-fights-MMA comedy, Here Comes the Boom showed up at the house. And then it sat, because I kinda, sorta wanted to see it, but I didn’t really really want to see it. But then, a piece of good luck came my way. That is, Friday night rolled around and I had nothing to watch. So, motivations aside, guess what went into the Blu-Ray player? I was very happily surprised by this one. The film had cute, funny, and serious moments, but never strayed too far into any of them to imbalance off. The “twist” just before the Big Fight was actually a surprise, but the good kind I should have seen coming. James did a wonderful job of transitioning from the jaded, self-interested teacher at the beginning to the thoughtful educator at the end, and still managed to make the fights moderately believable. And the final fight, which you knew would go a certain way, even maintained the tension necessary to keep it interesting. 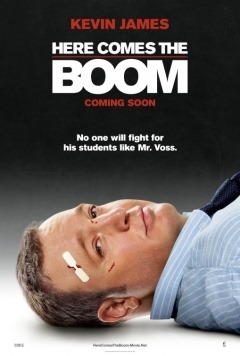 Long story short, Here Comes the Boom is the first Kevin James movie I can honestly say I’d be happy to watch again. And with a very respectable PG rating, it’s even a solid one to watch with the older kids in the family. If you haven’t seen it, I say take a jab at it. Get it? A jab? Haha! Boom! Wow. Sorry. I can even taste the shame from that one. From now on, I’ll just stick to the movies.